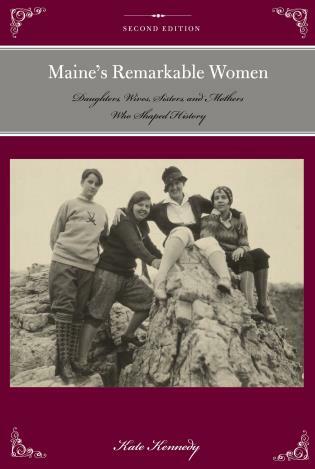 Maine's Remarkable Women tells the stories of fifteen strong and determined women who broke through social, cultural, or political barriers. Through their passions for art, exploration, literature, politics, music, and nature, these women made contributions to society that still resonate today. Meet Marguerite "Tante Blanche" Thibodeau Cyr, "The Mother of Madawaska," whose bravery and kindness during one brutal winter saved her frontier settlement; botanist-artist Kate Furbish, who explored Maine's wilderness, collecting, classifying, and painting all of its flowering plants; and Florence Nicolar Shay, a Native-American basketmaker who demanded and succeeded in gaining rights for her tribe, the Penobscots. Each of these women demonstrated courage, compassion, and an independence of spirit that is as inspiring now as it was then. Read about their extraordinary lives in this collection of brief and absorbing biographies. Kate Kennedy was the director of the Southern Maine Writing Project at the University of Southern Maine from 2006-2012. Her novel, End Over End, was published in 2001, and her short fiction and nonfiction has appeared in various small magazines. She and her husband live in Cape Elizabeth, enjoying three generations of family within a 65-mile span.